It may be the most famous American lager. You probably know how it tastes and that it’s now owned by Belgian brewing giant Anheuser-Busch InBev, but how well do you really know the King of Beers? 1. IT ALL STARTED WITH A FAILING BREWERY. Eberhard Anheuser’s family name is one of the most famous in American beer history, but he wasn’t a brewer. He was a St. Louis soap merchant who took control of the Bavarian Brewery after its owners defaulted on a loan in 1860. Unfortunately for Anheuser, Bavarian’s previous management ran out of cash for a reason—their beer was terrible. Anheuser didn’t have any more luck with it than his predecessors, but he got one lucky break. He bought his brewing supplies from a young German immigrant named Adolphus Busch, who fell in love with Anheuser’s daughter Lilly. The couple married in 1861, and Busch would go on to buy a stake in the brewery and become his father-in-law’s partner. 2. A REFORMULATION SPARKED A NEW LEVEL OF SUCCESS. Eventually, Busch realized the brewery would need to make a major change if it wanted to thrive. Busch began tinkering with the recipe, and in 1876 he teamed with local restaurant owner Carl Conrad to perfect a recipe for a refreshing lager in the vein of the Bohemian brews created around the city of Budweis. Busch and Conrad named the beer Budweiser in an attempt to win over German immigrants who were looking for familiar styles in their new home. 3. RICE PLAYS A KEY ROLE. The recipe “Conrad Budweiser,” as it was first known, included rice in addition to malted barley. The idea was that by including rice, the finished beer would have a crisper flavor. (Critics have noted that at many points in the brand’s history, this has been a savvy cost-cutting move since rice was cheaper than malted barley.) Whatever the motivation for including rice, the formulation caught on. The brand is the biggest buyer on the American rice market, and for a 17-year stretch from 1970 to 1987, Budweiser and similar brews accounted for up to 30 percent of all rice consumption by Americans. 4. PASTEURIZATION HELPED MAKE IT ALL POSSIBLE. While Busch had joined Anheuser when the Bavarian Brewery was renowned for its terrible beer, he soon became a trailblazer in quality control for beer. In the 19th century, brewing was mostly local since beer that traveled long distances would end up spoiling. Busch took a two-pronged approach to addressing this problem. First, he started pasteurizing his beer, a first for an American brewer. To further ensure this more durable beer survived its journeys, Busch also built up a system of refrigerated train cars that could be restocked at icehouses he built up in warmer parts of the country. Suddenly, the idea of a single beer dominating the national market didn’t seem so farfetched. 5. EARLY MARKETING EFFORTS INCLUDED A HIT SONG. Spuds MacKenzie and talking frogs were still decades away at the dawn of the 20th century, but Anheuser-Busch was already showing a knack for capitalizing on pop culture. In 1903, the company commissioned a German-style drinking song called “Under the Anheuser Bush” that invited the listener to “come and have a stein or two.” The song was soon recorded by Vaudeville star Billy Murray and became a part of the company’s marketing for decades. 6. YOU WON’T TASTE THE BEECHWOOD. You’ve probably heard the phrase “beechwood-aged” to describe Budweiser, but you’ve never tasted a note of beechwood in your glass. As part of Budweiser’s longstanding production process, the beer is aged in tanks with spiral strips of beechwood. This step isn’t meant to add woody flavors to Budweiser—it is simply a technique that’s used to put more of the yeast in contact with the beer. The chips of beechwood used for the process have been treated and sterilized so they won’t impart any flavors of their own, but introducing a substrate like the beechwood into the aging process can help remove undesirable flavors from the finished beer. 7. THE CLYDESDALES HAVE QUITE AN INTERVIEW PROCESS. The Budweiser Clydesdales have been an integral part of the brand’s marketing since 1933, when August A. Busch, Sr.’s sons presented him with a six-horse team as part of the celebration of Prohibition’s repeal. You don’t become marketing icons by letting any old horse join the team. According to the company, there are strict requirements for prospective Clydesdales. The horses are all geldings four years old or older that are 72 inches tall and tip the scales between 1800 and 2300 pounds. On top of those requirements, they have to sport a bay coat with a white blaze and legs, while their mane and tail must be black. Even with these restrictions, Budweiser has been able to build up a team of 250 Clydesdales, one of the world’s largest herds. 8. BUDWEISER BRIEFLY HAD ITS OWN VIDEO GAME. In 1983, arcade titan Bally Midway released Tapper, a video game that put the player in the role of a bartender who’s pulling beers for jocks, cowboys, aliens, and more. The game was notable for both its ornate cabinet that included an integrated bar rail for the player’s foot and for its heavy use of Budweiser branding. Budweiser sponsored the game, which included Budweiser logos and had the player slinging Bud. The integration made sense, but at least until observers began to wonder if an arcade game about serving beer might be encouraging underage drinking. To sidestep the issue, Bally Midway rereleased the game in 1984 stripped of its Budweiser regalia and rebranded as Root Beer Tapper. 9. ONE MARYLAND COUNTY SKIPS THE LAST TWO OUNCES. In the 1950s, Guy Distributing in St. Mary’s County, Maryland wasn’t having much luck selling Budweiser, which cost more than its local rivals. Owner George Guy had a brainstorm: Instead of trying to beat the locals by lowering his per-ounce price, why not sell smaller cans of Budweiser at the same price local breweries charged for the traditional 12-ounce can. Guy convinced Anheuser-Busch execs that the idea might work and started making special 10-ounce cans for the market. One visit from the Budweiser Clydesdales to the 1956 county fair later, and 10-ounce cans were on their way to becoming local staples. While the beer in these cans is identical to the rest of the brew sold as Budweiser, devotees swear that something about the smaller cans makes the Bud taste better, especially since a smaller volume leaves less time for a beer to get warm or go flat. 10. ITS LITTLE BROTHER OVERTOOK IT IN 2001. 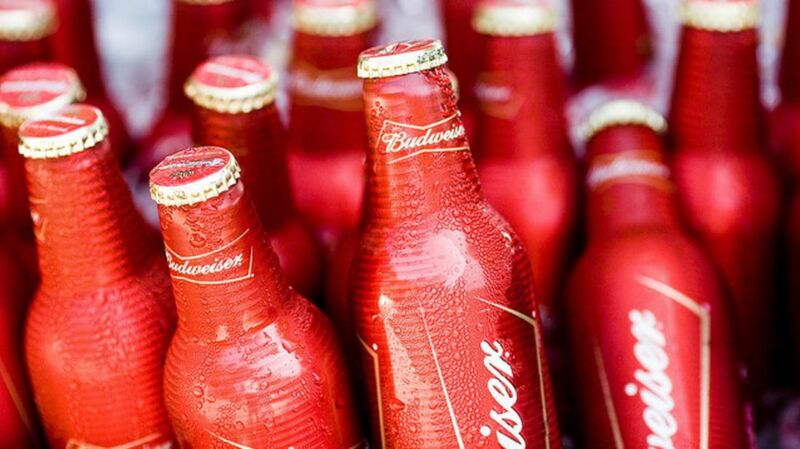 Budweiser was still the top dog in the American beer world in 1982, but as drinkers started drifting to offerings like Miller Lite, Anheuser-Busch countered by introducing Budweiser Light. The company may not have known it yet, but Budweiser was close to peaking—in 1988 it produced a record 50 million barrels of Budweiser. On the back of humorous ads, Bud Light rose to take the number one spot on the American market in 2001. Coors Light surged past Budweiser to take the second-place trophy in 2012. As of 2014, Budweiser is still holding down third place. 11. IN CONTINENTAL EUROPE, IT’S JUST BUD.